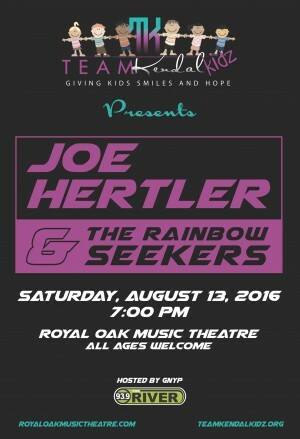 We heard you loud and clear so save the date because Joe Hertler and the Rainbow Seekers will be rockin’ our stage once again this year! If you would like to SPONSOR this event please contact us atinfo@teamkendalkidz.org. Sponsorship packages are available. Please join us for a night of fun all benefiting kids with cancer. Tickets purchased through Team Kendal Kidz will be held at will call at the Royal Oak Music Theatre until 8pm unless otherwise specified. ID will be required to pick up your tickets so PLEASE use the ORDER COMMENT box at the bottom of the checkout page when using our site to list any additional names needed. for pick-up. On August 27th the Wheelin’ for a Cure Committee will be at the Grand Rapids Metro Cruise on 28th St. in the Grand Central Plaza with No Limits Motorsports, (across from BWW) Stop by and enjoy a Moink BBQ sandwich, chips and cookie all for only $5.00. Cash or Charge. All proceeds will go to Special Day’s Camp. The 27th is also the last day to sign up for the Wheelin’ for a Cure event to receive your FREE T-shirt. We hope to see you all there!!! A Moink is a meatball wrapped in bacon, smothered in the WFC signature BBQ sauce served on a Hawaiian Sweet Roll. Very Yummy!!!! Team Kendal Kidz make $25,000 donation! John and Heather Lividini recently presented a check to Special Days Camps in the amount of $25,000 making them one of our largest donors in 2015. It’s only with support of organizations like Team Kendal Kidz that we are able continue to operate our program and we can’t thank them enough for believing in our mission. Team Kendal Kidz is dedicated to giving kids with cancer SMILES for today and HOPE for tomorrow. SMILES for today will come from sending children with cancer to Special Days Camp. Special Days is located in Montague, Michigan and is a place where kids can be kids again. HOPE for tomorrow will be in our research dollars donated to Children’s Cancer Research Fund. Our donations will go directly to the University of Minnesota’s current use funds for pediatric cancer research. Support Camp While You Shop! Do you shop at Amazon.com? If so, then consider using smile.amazon.com! It’s the same Amazon.com, except that when you shop at smile.amazon.com and select Special Days Camps as your charity, Amazon will donate 0.5% of the purchase price to camp! There is no additional cost to you. Camper and Staff Applications for Winter Camp 2016 have been posted! Please return your completed applications as soon as possible, space at Winter Camp is limited. Don’t miss out! Winter Camp is January 29-31, 2016 at YMCA Camp Pendalouan. We are thrilled to publish a new website for Special Days Camps! Much of the work to update our site was done in just one day by a group from Hackathon for Social Good. Special Days Camps thanks these volunteers for their time and efforts! We love our new site, and hope that you do too.